Great Puma: Daniel Bryan. 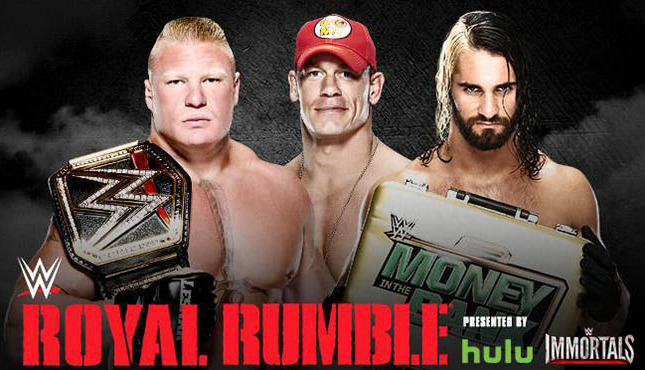 This Rumble is Bryan’s to lose. He’s the only wrestler on the roster that receives a superstar pop. The writing for Roman Reigns set Reigns back at least a year before he should ever really be considered as a top guy. I think Bryan vs. Brock has a certain buzz to it and there’s no better way to pass the torch than for Bryan win the Rumble, then go over the Beast Incarnate in the main event at Wrestlemania. That’s the only finish to the Rumble that the Philly crowd will be 100% behind. I’ll be on the lookout for the “Bryan Wins or We Riot” sign. Mascara De Fuego: Daniel Bryan. Bryan as been the only person whose even bought up wanting to win the Rumble more than once on TV. He’s the only option that makes sense. People wanted to see him win the Rumble last year and got cheated out of that, I think we all still want to see him do that. Bryan making a return from being injured is the only thing saving WrestleMania’s main event. The WWE keeps looking for a Cena-replacement but what they don’t realize is that if that is what they are focusing on, they are doomed to fail. Daniel Bryan IS your main eventer. Now, as much as I think a match between him and Rollins would be a solid main event, I do think the bigger story would be Bryan taking on Brock Lesnar for the Title. How much more could that prove Bryan’s main event spot if its HE who finally takes down the man who broke the Undertaker’s streak… something to think about. Mascara De Fuego: Uso’s. The match will be good but we’ve seen it multiple times and the match has played out the same each time with the same spots and move sets… Slow to start with Miz taking control of one of the Uso’s… Mizdow reenacts the match from the apron… the Uso’s do a couple of highspots to the outside… Miz and Mizdow have a miscue that costs them the match. End of story. Great Puma: Miz & Mizdow. Naomi isn’t a part of Total Divas anymore so I don’t think the Uso’s are high on the WWE’s short list of priorities. MizdowMania is still going strong so why not send the Philly crowd home happy. Great Puma: The Ascension. I have faith in the WWE that they won’t completely bury the Ascension just yet. There’s no better way to get some heat on a new team than to have them go over an aging tag team way past its prime. Right? Mascara De Fuego: New Age Outlaws. With the way the Ascension has been treated since they got “called up”, I don’t see why they would even bother having them go over the Outlaws. Maybe they are setting up a big Mania match against them and maybe Demolition or maybe they are just another couple of guys paired together on the roster. Man, why would anyone want to be called up from NXT when that is the brand to watch! Mascara De Fuego: Bella’s. That’s all I gotta say about that. Great Puma: Paige and Natalya. I like Paige. I want to see Paige win. Yes, this is my obligatory full mark pick. Great Puma: Big E. This is the New Day’s last chance to get over. Why not give them a W here. Mascara De Fuego: Tyson Kidd (lone survivor). Might have some cools spots in the match but at the end of the day, Kidd will be the only one left. This entry was posted on January 23, 2015 at 10:22 pm and is filed under Analysis/Commentary, predictions. You can follow any responses to this entry through the RSS 2.0 feed. You can leave a response, or trackback from your own site.